Dickie Bird is arguably the most famous umpire in the history of the game of cricket. He was born in 1933 and raised in Barnsley, Yorkshire, into a mining family. Times were never easy in the days of Dickie’s childhood and youth. His Father spent his last few shillings buying cricket equipment and football boots to enable Dickie to follow his passion for sport. He is a great advocate of the family unit and knows firsthand the tremendous support and enormous sacrifices his parents made to ensure he was able to follow his destiny. Dickie Bird went on to play Cricket for both Yorkshire and Leicestershire between 1956 and 1964, scoring over 3000 first class runs, before turning his attention to umpiring. He umpired his first Test Match in 1973 and finally called it a day on an emotional day at Lords in June 1996. He umpired 68 Test Matches, 92 one day International Matches, 4 World Cup Finals, The Queens Silver Jubilee Test at Trent Bridge between England v Australia in 1977 and The Centenary Test match between England v Australia in 1980. 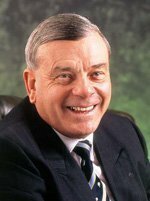 Dickie Bird is known, and held in great esteem, throughout the world on four cricketing continents and the West Indies. In 1977, he was voted Yorkshire Personality of the Year, Yorkshire Man of the Year and in the People of the Year Awards in 1996, and has Honorary Doctorates at Hallam and Leeds Universities. Dickie was made a Freeman of the Borough of Barnsley in June 2000. He has numerous Life Memberships including the MCC, Yorkshire and Leicester County Cricket Clubs, Barnsley Football Club and Cambridge University Cricket Club. Dickie received his M.B.E. from the Queen in June 1986 and an O.B.E in 2011.